Spring has fully sprung here in the Midwest and I feel fantastic about it. Not only am I in possession of a beautiful home, but with that home comes a beautiful tiny piece of the earth which sustains us. It is upon this earth that I grow a garden with which to sustain me, my family, and my soul(of course). I truly love gardening; it's like therapy, only you get potatoes, and usually lots of them. I grew a potato tower last year, and though it was a rather short one, I still got over 50 lbs of potatoes in one crop. I also grow corn, squash, melons, spinach, and cabbage. Melons and squash are thirsty little babies that require a lot of water and sun, so anything to make it a little more sustainable to grow, I'm all for. 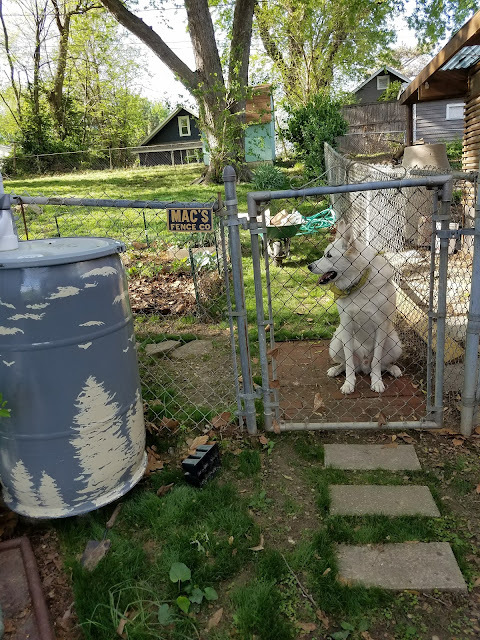 I grew up in Tucson, AZ, where a rain barrel is absolutely essential if you want to have any sort of garden other than caci, and even those need a little something here and there if you want them to thrive. I remember the two rain barrels in my backyard, always full of mosquitos, and getting eaten alive. In spite of that, I remember liking them. I remember being barely tall enough to see the top of it, and pretending that the reflection in that black barrel's waters was a portal into another world. I used to think I was a princess that was from a hidden mountain kingdom, trapped in the desert, and that my only way back was by looking into my magic black mirror, which was the water in the barrel. I think I made up this whole fairy tale about myself, and how the spirits of the mountain streams were trying to tell me how to get home, and sending messages in far-travelling rain clouds, collected by the rain barrel. I'd spend longer than I care to admit, just wishing to hear the voices of my people again, staring into the black waters of that rain barrel. Highly oxygenated and free of softeners, flourides, etc., that might be in the water you get from the city. Rain barrels help control the moisture level in the foundation of your home, which is a very good thing if you have a basement! In Kansas City, water is roughly $0.49/gallon. 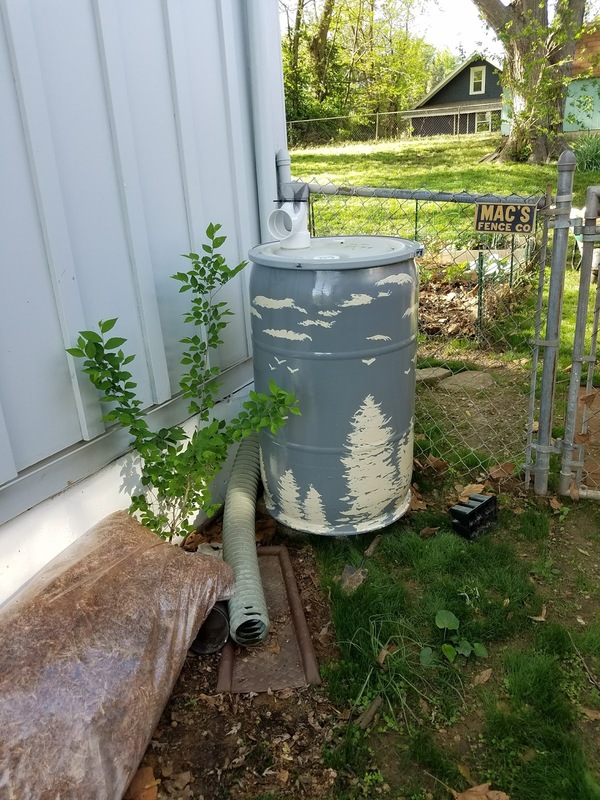 My rain barrel holds 50 gallons of water, and that means, per barrel, I save $24.50. It's not much, but if it were to save me $24.50 per month, then that's a spare $294 per year. You can paint a rain barrel! These parts were pretty darn inexpensive, and the paint, brushes, and sandpaper we used to decorate the barrel weren't much more, either. I think I spent $20 on the paint and brushes, but I already had the pans, paint remover/mineral oil, and every other bit of stuff I needed. I guess what I'm trying to say is that this is a perfect project for those that are already set up to do some handiwork of their own. B has a workshop in our garage, so tools are no problem for him. I don't know if I could have done this as easily as I did without him. Basically, I'm a strong, independent woman until I'm not. I just figured I'd throw that in there, just in case my lifestyle blogging is giving you that false sense of ease. I don't like to make any bones about how easy or how difficult something is. It just feels dishonest, you know? So maybe do this one with a friend, if you - like me - aren't handy. Once the supplies were gathered, we drilled a hole about an inch off the ground from the bottom, into the side of the barrel. 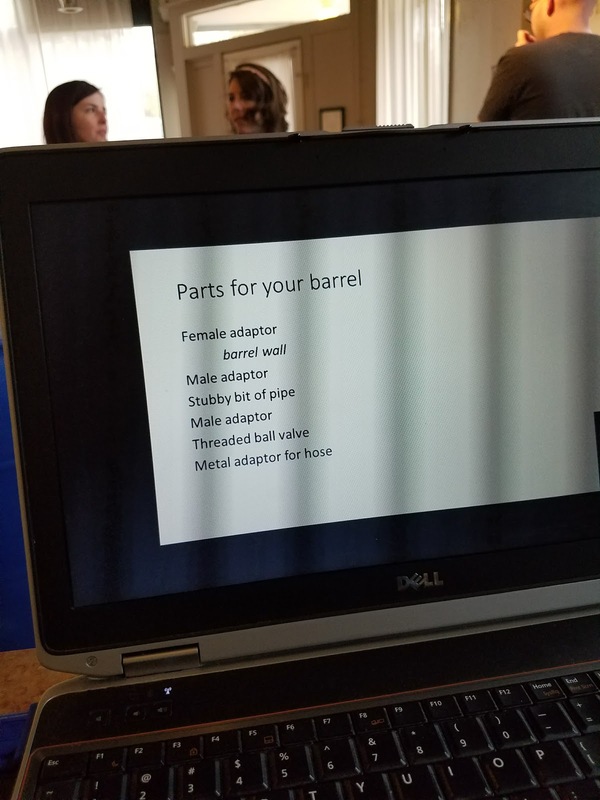 The female adaptor went on the inside, and then we screwed the male adaptor in. (That's what B was doing in that photo.) Next, sand the inside of the other two male adaptors and the outside of the pvc pipe, then glue them in. Connect everything normally and boom! You've got yourself a spigot! All that's left now is to figure out the placement...but while you're thinking on that, you may as well decorate it. 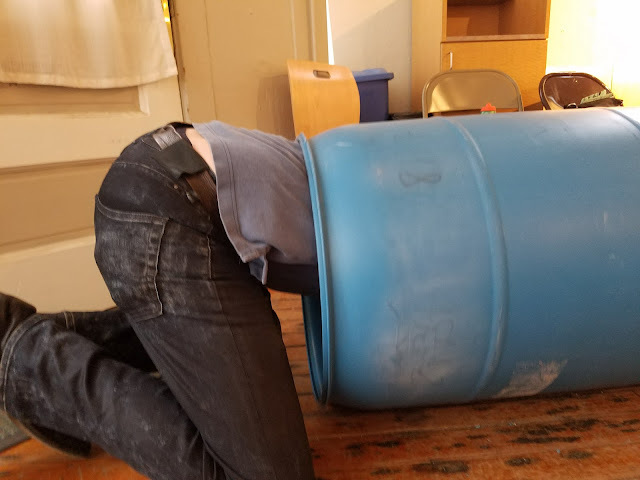 Even though cerulean is my favorite color, I didn't think B would like a big, blue, industrial-looking barrel outside of our nice house. (I don't think I would, either, as it is a little industrial-looking.) We decided to paint it, together, and boy was it fun! It only took us a single afternoon to do, so here's how we did it. Even though the mineral spirits(which are used to removing the paint) are odorless, they still smell. The paint smells, too, so be sure to work in a well-ventilated area. I actually love the smell of paint - I associate it with creation and renewal - but I don't want to die from paint fume inhalation. I'm certain you'd like to not die from paint inhalation, as well. 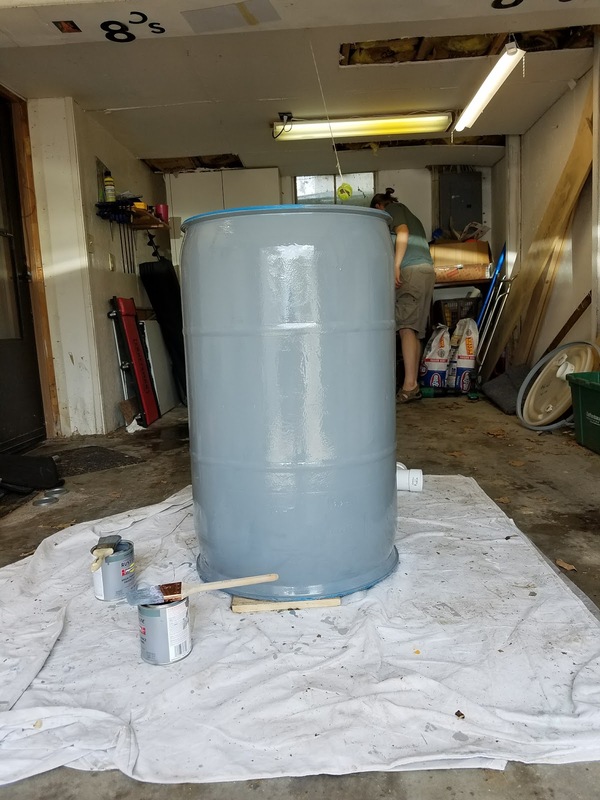 We sanded the outside of the barrel and painted two coats of the base color for a nice matte finish. The can said to let the paint dry completely, which should take 6-8 hours, but ours dried to a relatively dry finish within a mere one hour. We also didn't care too much if it was perfect-looking, so we fudged it a little. 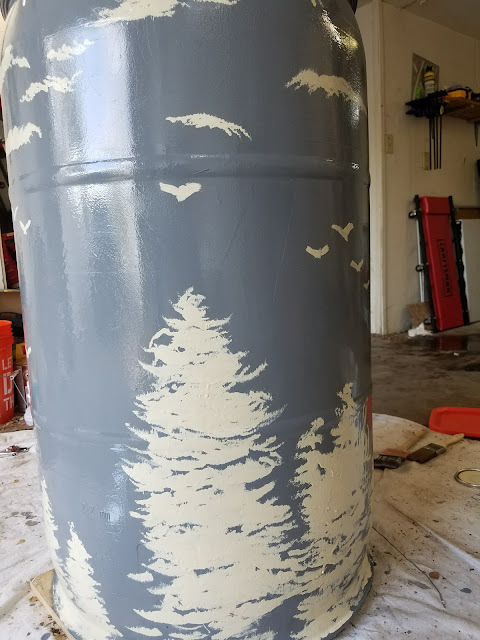 I think we waited about an hour and a half between the two base coats, and then about 20 minutes for the next step, which was to add the trees. I spent a good portion of my childhood watching "Painting with Bob Ross" on PBS along with my granny. She was a wonderful artist and favored pastels over paints, but I was addicted to everything he did with acrylics and oils. One of the things he said with many of his episodes was to paint on a wet surface. 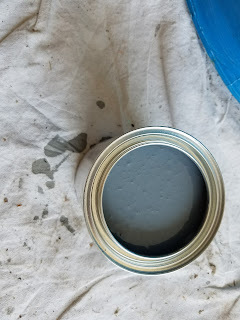 As the paint colors raced in yellow text along the bottom of the television screen, he would mention that he'd already coated the canvas with a liquid white in preparation...thus my reasoning for rushing through the job! The paint on the barrel wasn't necessarily wet, but it was tacky, so it took the accent coating nicely! Let's paint some happy little trees! I used the fan brush to make trees using Bob Ross's technique! I started the video at 17:03, where the particular piece of technique he uses came in handy for my own work. See, my own happy little trees? I know they're not perfect. I don't mind so much; after all, we don't make mistakes - we just have happy accidents! My own happy little trees remind me of a picturesque scene of winter against that cool gray. I just love the birds that B painted on, and the clouds were a nice fun touch, as well. 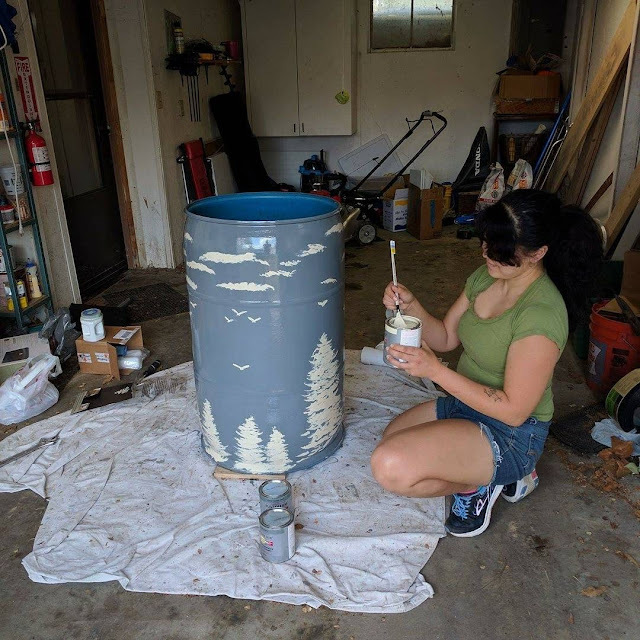 I hope this has inspired you to do your own wonderful version of a painted rain barrel in your own home. I personally think that it's a better thing to spend an evening with your partner making something than simply just going out to dinner. Having something tangible, something that you made, some proof that you were there...well, hey, there's just something special about that, isn't there? 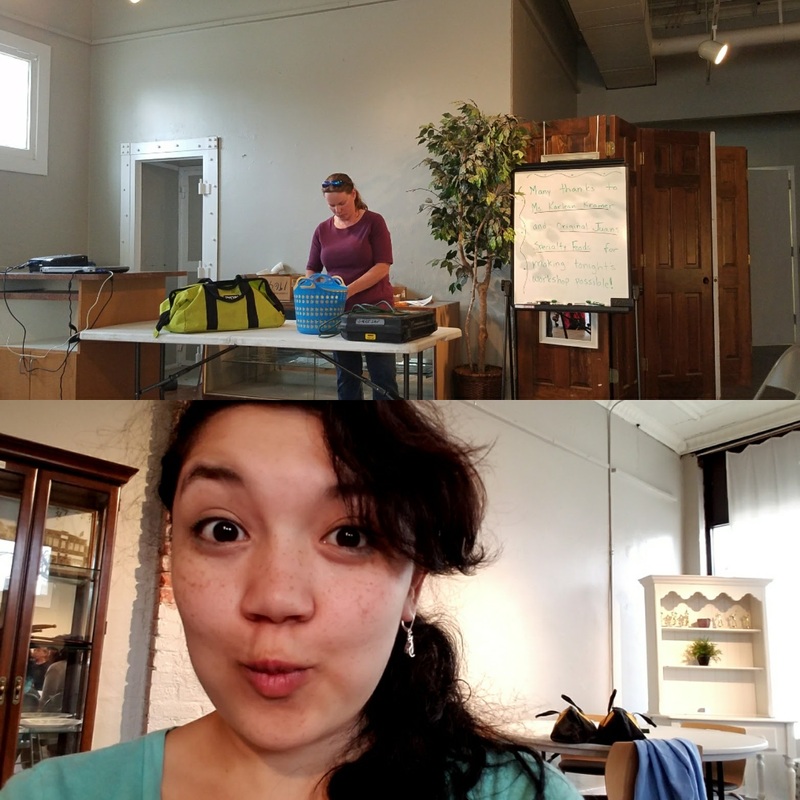 Happy crafting and happy gardening!